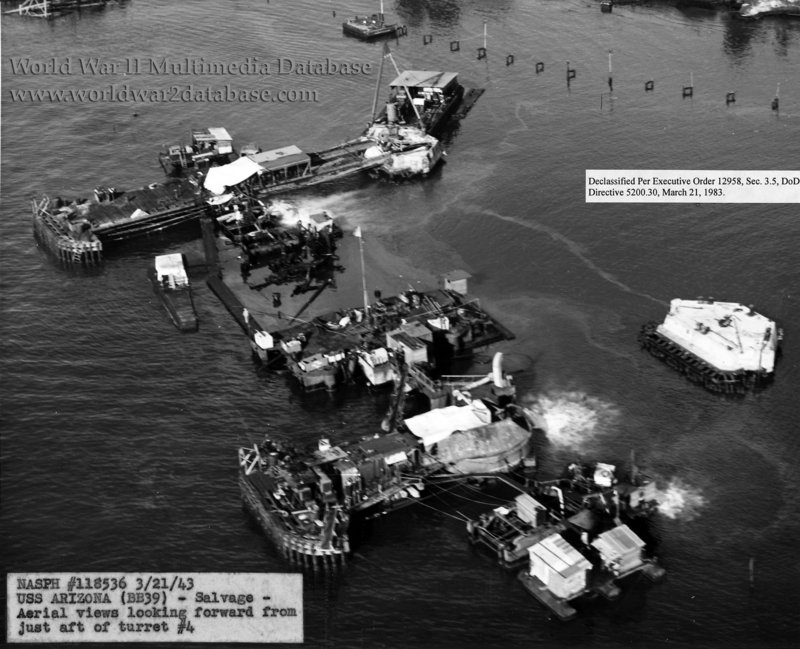 Aerial photograph of the salvage of the wreck of the Arizona on March 31, 1943, by the Ford Island Naval Air Station. The ensign of the United States still flies from where her mainmast used to be. Pumps are draining water from turrets #2, #3 and #4, prior to cranes coming in to remove #3 and #4. The guns have already been removed, except for turret #1, which still has its guns to this day. On the day this view was taken, divers cut wreckage from aft of turret #2, the main deck, and the port side; they removed 1.5 tons (1.36 metric tons) of scrap. They also recovered gas masks from inside the ship. The guns from turret #2 were mounted on USS Nevada (BB-36) in 1944; they fired in anger at Iwo Jim and Okinawa. The guns from turret #3 and #4 were given to the Army for shore installations, becoming Battery Arizona on the west coast of Oahu and Battery Pennsylvania on Mokapu Point near Kaneohe Naval Air Station. These batteries were not operational until a few days before the war ended. The Ordnance Section was successful in removing from Arizona in the early days a great deal of the anti-aircraft battery with its ammunition. Much other ordnance material was recovered from the ship even as late as November 1942. The superstructure was removed in 1942; further scrap was removed to make way for the Memorial opened in 1962 and dumped on Waipaio Point near the West Loch. An act of Congress provided for non-profit and governmental institutions around the United States to request pieces of the Arizona for their own memorials.